Blackstone Labs Euphoria, 16 Caps at SameDaySupplements.com® for lowest price. Do you need to unwind after a long, stressful day at the office? The thoughts in your head begin to think of having a drink or two is intriguing, but you don’t want the inevitable hangover and sluggishness that inevitably results from a night of drinking. What Is Blackstone Labs Euphoria? Euphoria is an all-natural, hangover free relaxation supplement that helps you unwind no matter how tightly you’ve been wound. Euphoria is ideal for a chill night at home or a night out partying with your friends. It’s also ideal for the more introverted folks who have a hard time cutting loose in social settings. One serving of Euphoria and you’ll swear this stuff can’t be legal! It’s just that good! How Long Does Blackstone Labs Euphoria Take To Kick In? After you took the recommend serving of 4 capsules,15 minutes later you’ll begin to have your face, ears, and neck get warmer. The overall relaxation and happiness you will experience with Euphoria will be so overwhelming that you will wish it could last forever! Blackstone Labs Euphoria is like nothing you have ever experienced in any other mood enhancement products. What's In Blackstone Labs Euphoria? How Do I Take Blackstone Labs Euphoria? 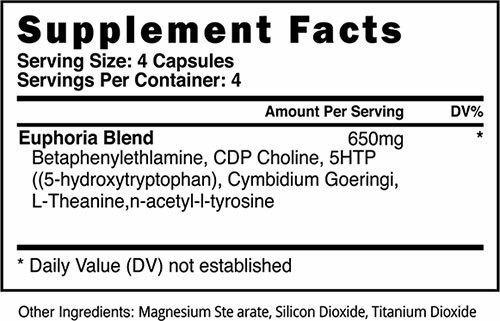 Dosage and Directions: Take 4 capsules of Blackstone Labs Euphoria on an empty stomach. After 30 minutes, 2 additional capsules can be taken for maximum effect. Do not exceed 6 capsules per serving or daily. KEEP OUT OF REACH OF CHILDREN. This product should not be taken by individuals under 18 years of age. Consult a licensed health professional before taking this product. Do not operate machinery or a motor vehicle, while under the effects of this product. You should not take this product if you have any current or pre-existing medical conditions, or if you are pregnant or nursing. Do not take this product if you are currently taking any prescription or over-the-counter medications. Do not exceed recommended serving as it could result in serious adverse health effects. Love it Review by Tiffany K.
Chill out Review by Cory O. We have a large selection of in-stock BlackStone Labs products including Mood Enhancement items and others for the lowest prices at SameDaySupplements.com® It's always easy to shop for Blackstone Labs Euphoria, 16 Caps at SameDaySupplements.com because you can browse by reviews, brand, prices or search for specific ingredients using our search tool. In-stock orders placed before 3pm EST ship out the same day to USA, Brazil, United Kingdom, Canada, Germany, Australia, Japan, India, France and worldwide at the cheapest prices online.